The Metropolitan Museum of Art’s new special exhibition opens this week, celebrating Andy Warhol’s career by examining his influence on other artists – both his contemporaries, and continuing through to the present day. 25 years on from Warhol’s death, the exhibition’s tagline is 60 Artists, 50 Years – it’s a lot to take in, and at times I wondered if it wasn’t a little too ambitious in scope. For all the sensory stimulation, the colour and incongruous objects and confronting images, I walked out feeling a little hollow. I suppose now every special exhibition is doomed to fall short of the curatorial gut-punch delivered by last year’s transcendent Alexander McQueen retrospective, Savage Beauty. The strongest part of Regarding Warhol is of course Warhol himself, and particularly the quotes from him peppered throughout. I tend to think of him more as a hustler than an artist. He was a master of the quip. Buying is much more American than thinking. Housed in a huge space within the Met, the exhibition is divided into rooms and themes, starting with Daily News: From Banality to Disaster. In the 1950s Warhol worked as a graphic designer and illustrator for department stores and magazines, and he carried this eye for packaging and advertising into his artistic fixation on mass consumption. Other artists in this section: Polke’s distorted dot paintings and Barbara Kruger magazine covers. Robert Gober went a step further and made his own newspapers. Ai Weiwei’s 2010 Neolithic vase with CocaCola Logo, is a startling piece, the logo blemishing a vessel dating from 5000-3000BC. 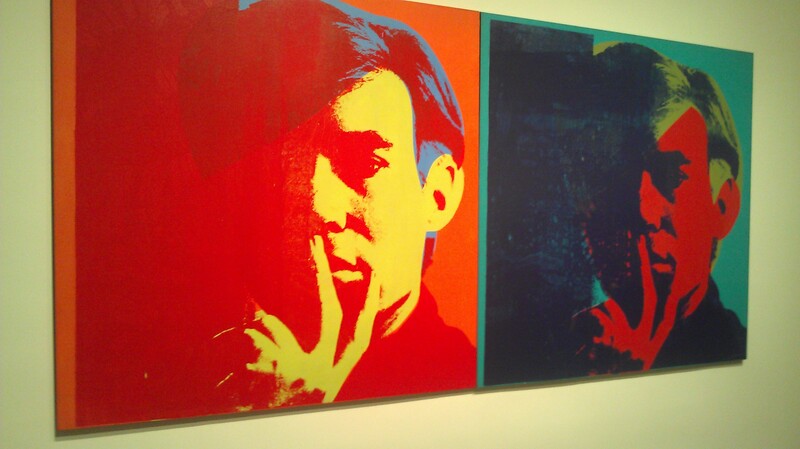 There are early Warhol silkscreens from 1962 like Big Campbell’s Soup Can and Green Coca Cola Bottles. Hans Haacke’s giant pack of Helmboro Country cigarettes (1990) dominate the room, and Tom Sachs’ Chanel Chainsaw from 1996 is darkly comic. The section then explores Warhol’s work with images from the news media – reproducing photographs of electric chairs (Orange Disaster, 1963) and brutality (Birmingham Race Riot, 1964). Other artists in this section include Kelly Walker, who used chocolate as paint over a photograph of a riot, Basquiat’s 1981 Untitled (Head), and the glowing neon Eat/Death by Bruce Nauman (1972). You can even get a sugar hit from Felix Gonzales Torres’ 1972 Untitled installation – a never ending pile of jewel-hued cellophane-wrapped candies. Portraiture: Celebrity & Power shows the Warhol we know best – the artist who reinvented portraiture, and indeed celebrity, as we know it. Warhol worked from photographs of his favourite friends and famewhores, usually with a Polaroid camera and always with a flash. He wasn’t concerned with naturalist detail: “Always omit the blemishes,” he said. Warhol’s iconic Turquoise Marilyn (1964) shares wall space with Richard Avedon (a photograph of a bloated and blotchy Truman Capote in 1974), Chuck Close (photorealistic “head” of Philip Glass, 1969) and Jeff Koons’ gilded sculpture of Michael Jackson & Bubbles (1995). Also in this section are some of Warhol’s famous Screen Tests videos from the Factory – Lou Reed, perfectly still but for the occasional blink; Nico, restless and luminously beautiful. Consuming Images: Appropriation, Abstraction & Seriality is another well-known facet of Warhol’s work and here we see lots of different ways of reproducing and reinterpreting imagery. Baseball (1962) was one of Warhol’s first silkscreen paintings and shows him finding his feet with the idea of mass production in art. “You get the same image, but slightly different every time,” he said. “It was all so simple – quick and chancey.” A fun piece here is Vic Muniz’s 1997 chocolate syrup rendering of Hans Nameth’s 1950 images of Jackson Pollack at work. Another Pollack reference comes in the form of Warhol’s Oxidation Paintings from the late 1970s. I had never heard of these, but was rather tickled by their origins: Warhol invited friends and visitors to the Factory to piss on canvases coated in copper metallic paint, creating drips and streaks of reactive colour. The last theme is Art Without Boundaries: Business, Collaboration & Spectacle. 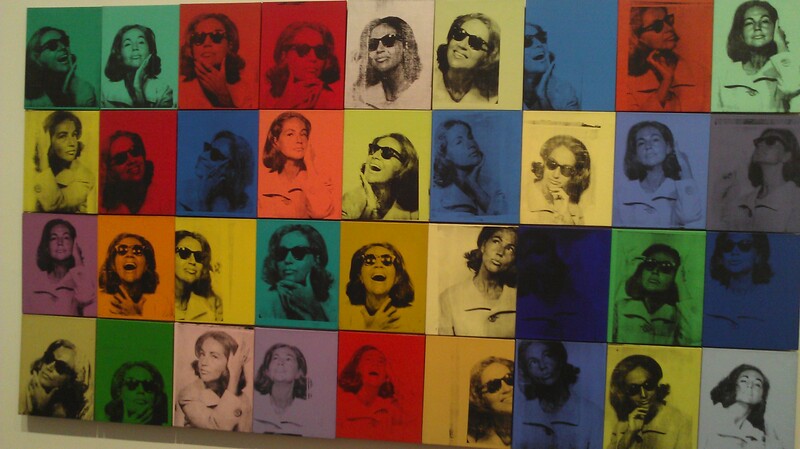 Perhaps Warhol’s most lasting influence is the ground he broke for artists as commercial entities. In 1975 he launched a phase of what he called “business art” with projects like Interview magazine, TV shows and product endorsements. There are some fun pieces in this section, including Velvet Underground collaborations, Jeff Koons’ Puppies, hypercolour Cosmos wallpaper by Murakami (2003), Cory Arcangel’s 2002 Super Mario Clouds projected from a hacked gaming cartridge, and reality television shows that Warhol jokingly predicted decades ago. There’s also a lovely quote from Warhol about the spirit of collaboration and celebration at the Factory, and in New York in general in the 1960s. There was always a party somewhere: if there wasn’t a party in a cellar, there was one on a roof, if there wasn’t a party in a subway, there was one on a bus. The last room of the exhibition is the most fun and sensorily provoking. Saturated with Warhol’s Cow Wallpaper, hot pink on an acid yellow-green, the room is filled with silver inflated pillows like giant goon bags (or box wine bladders, for the non-Australians and non-bogans reading). The helium-filled pillows float about the space, buffeted by fans and viewers’ hands, as Velvet Underground songs play. With that last whimsical moment you’re propelled into a fluorescent-lit bazaar of handsomely bound catalogues, trinkets and prints. Old Andy would surely have approved of today’s Exit Through The Gift Shop gallery culture. Regarding Warhol: Sixty Artists, Fifty Years is on show at the Metropolitan Museum of Art, New York, from September 18 to December 31 2012.